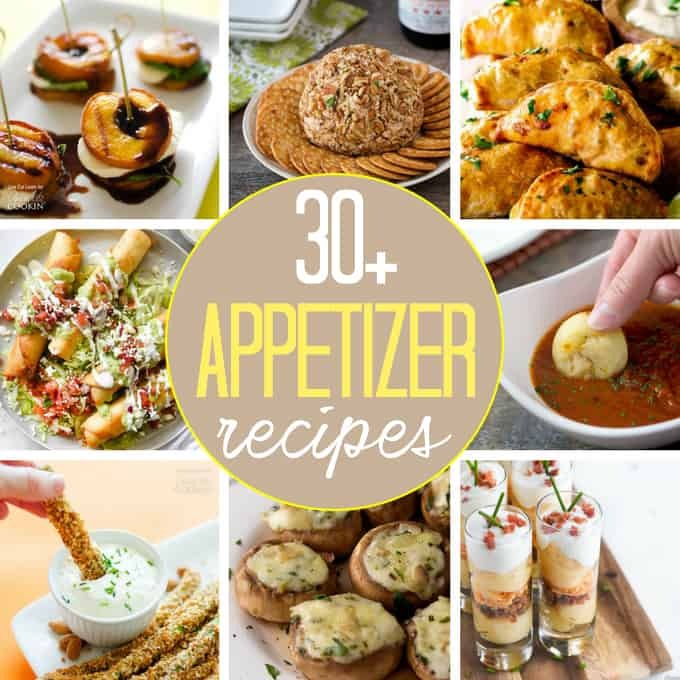 Easy and Tasty Appetizers: a collection of 30+ appetizer recipes! If I could eat just appetizers… I would! Easily the best part of any party, appetizers are always a safe bet – whether you’re greeting a crowd or just having a few friends over. 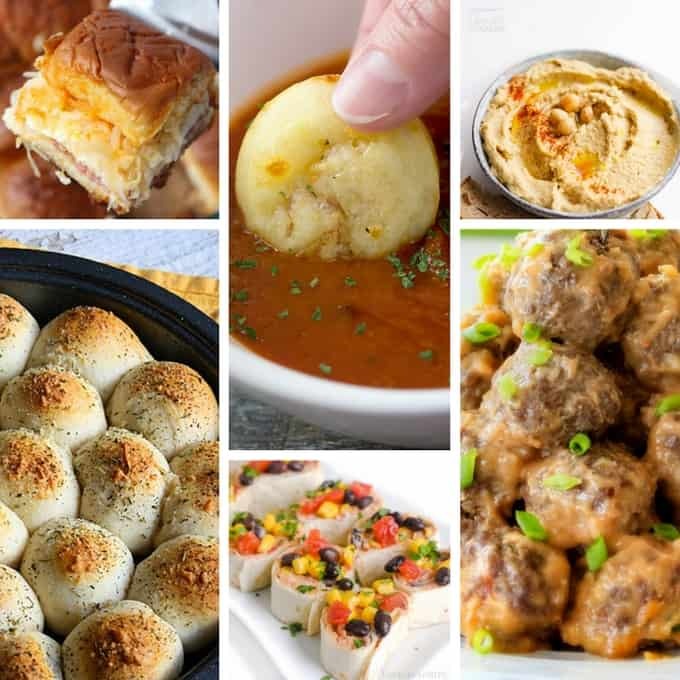 We’ve gathered 30 Appetizer Recipes that everyone is sure to love! 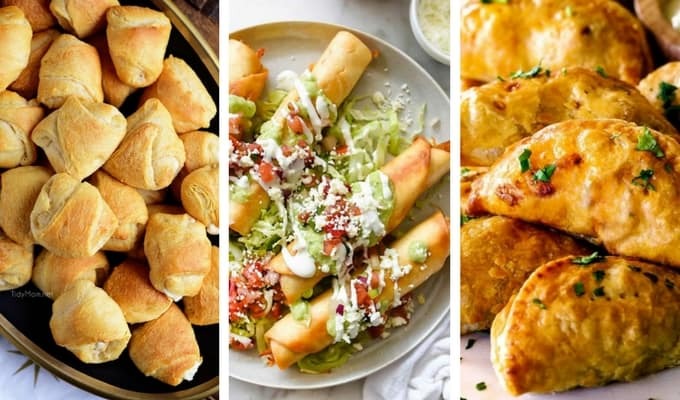 Prepping a few appetizers is way less work and stress than making an entire meal – if one recipe doesn’t turn out, you’ve still got plenty to spare! Appetizers can be upscale or casual, depending on how you serve them. Cute cocktail picks, small plates or napkins, and how you set up your tablescape all set the mood for your festivities. 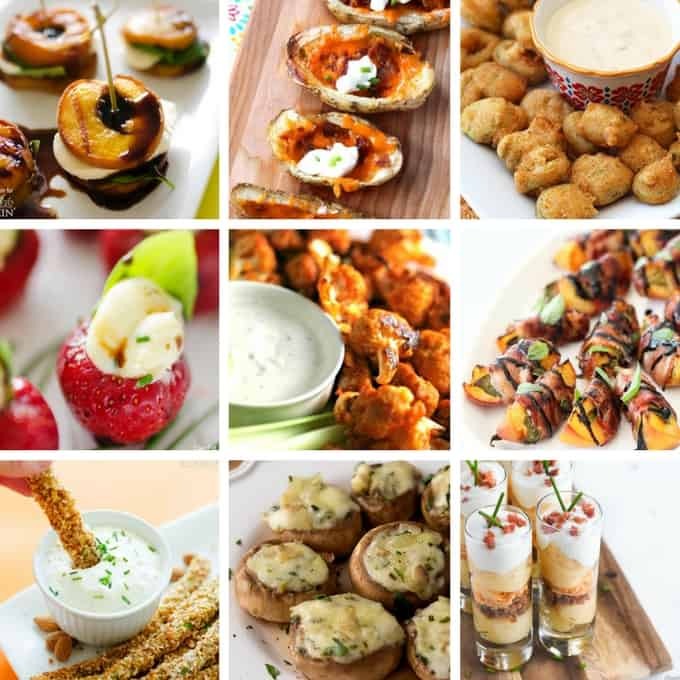 Appetizers are also a great choice for a potluck theme! 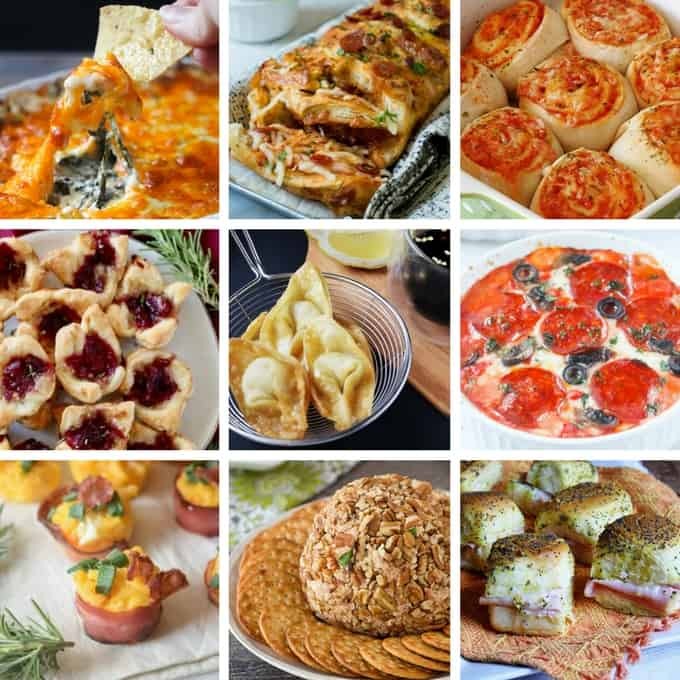 Have friends bring their best appetizer and pick yours from this list! A Grilled Peach Caprese is a pretty & unexpected appetizer – perfect for when peaches are in season. These Loaded Baked Potato Skins from Sugar, Spice & Glitter are a classic and slightly healthier than the fried pub version. Spice things up with some Fried Jalapeno Slices (and dip)! Potatoes – in a shot glass? I need to try this recipe from Fantabolusity to believe it! Stuffed mushrooms get a cheesy upgrade with these Mozzarella Parmesan Stuffed Mushrooms. Asparagus fries double as a fun appetizer or a delicious side dish. You just can’t imagine how delicious these Whipped Brie-stuffed Strawberries must taste! Buffalo Cauliflower Bites from Real Housemoms is a great option for a healthy appetizer that still tastes indulgent. Hot Spinach Dip is super easy to whip up and always a crowd favorite – look at all that cheese! Pizza Pull Apart Bread from Sugar, Spice & Glitter is the perfect appetizer for a movie night with friends or family. Pizza Roll-ups are one of those appetizers that also make for great leftovers! Lunch appetizers, anyone? Skip the pizza delivery and make this hot & cheesy Pizza Dip. Ham & Cheese Sliders are a great portable appetizer if you’re contributing to a potluck! Cheeseballs are a classic – and this Gouda and Sun-dried Tomato Cheeseball will go over like gangbusters! This is a perfect appetizer for picky eaters or kids – Mac & Cheese Bites from In the Kids Kitchen. A mess-free way to enjoy melty cheese – Cranberry Brie Bites from Princess Pinky Girl. Bacon Cheddar Cream Cheese Dip (not pictured) is an ooey-gooey bacon lover’s favorite! How many ways can we reinvent pizza? I’m still figuring that out – and to add another to the growing list is this dippable Pizza Puff! For guests that are watching what they eat, a Baba Ganoush Hummus is a tasty and safe option or try our basics on how to make hummus! These Thai Coconut Meatballs from Real Housemoms look absolutely mouth-watering! These Taco Pinwheels from Fabulosity look super easy and tasty! Meatball-Stuffed Biscuits are sure to be a crowd-pleaser and can also double as a delicious side-dish if you have leftovers. These Garlic Chicken Puffs from Tidy Mom are all wrapped up in one tidy crescent roll package! I will definitely be making these Chipotle Chicken Taquitos from Foodie Crush soon! Our copycat KFC Coleslaw recipe is always a hit at parties, potlucks, and summer BBQ’s. It’s an easy appetizer that everyone loves. 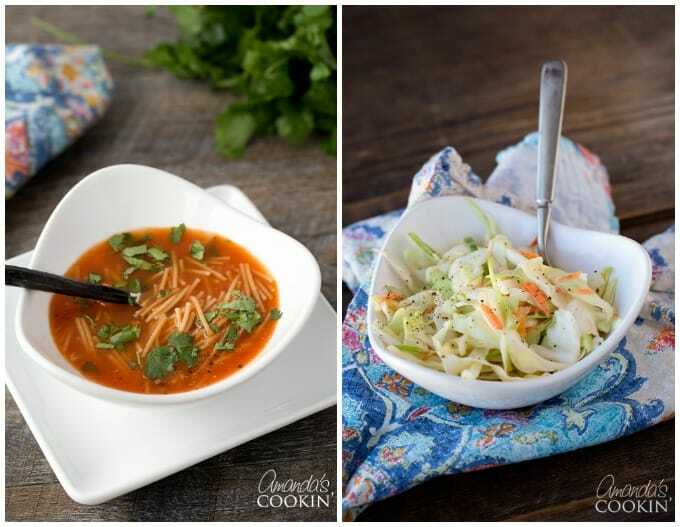 We also couldn’t forget to tell you about our fideo soup, that appetizer you get at all the Mexican restaurants! 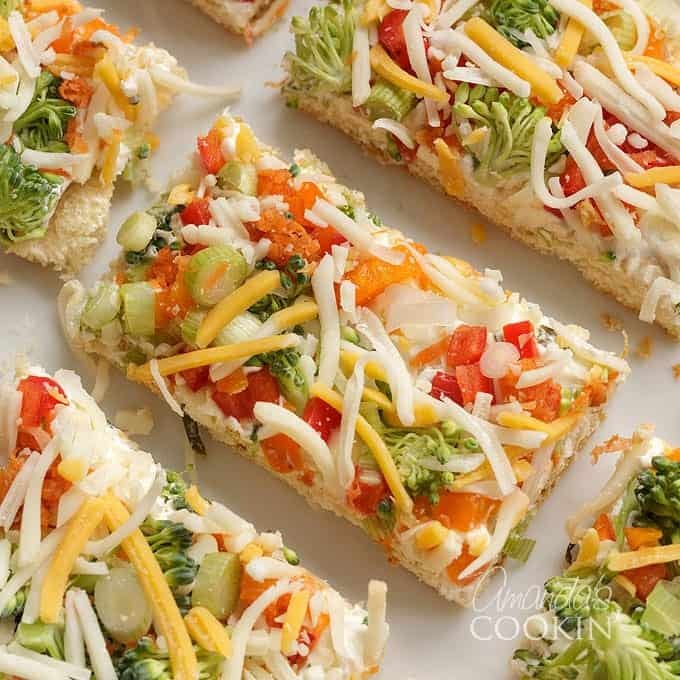 One of my favorite appetizer recipes to date is this Veggie Pizza! It makes the perfect dish to bring along to any type of gathering, or even for the big game! You’ll definitely want to bookmark this one. 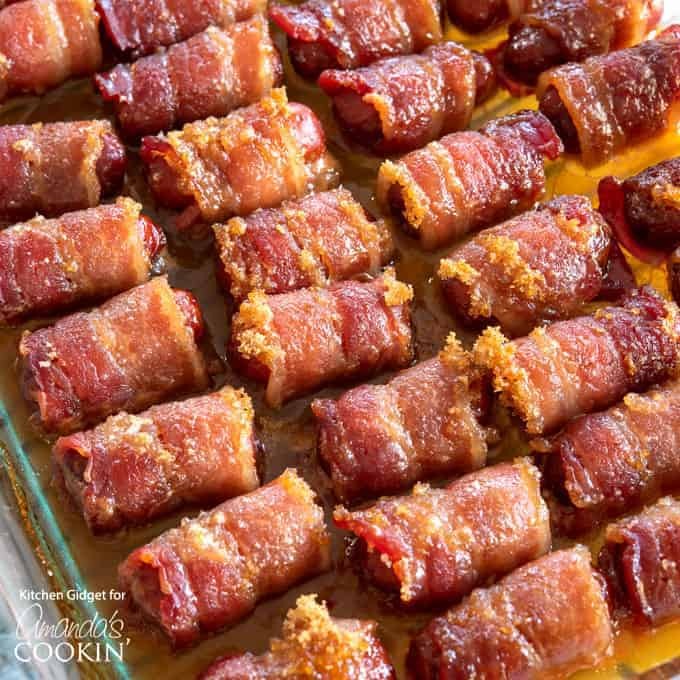 These bacon wrapped smokies are new on the blog and PERFECT for game day or holiday gatherings (or just about any time of the year). These smokies are a crowd favorite! What’s your go-to appetizer recipe for entertaining? Which of these is going on your must-try list?